Will Hutchins reminisces about cameramen and makeup on at Warner Bros.
Howdy! Awhile ago, Babs and I found ourselves at a long table in a New Jersey hotel signing 8x10s for all the pretty people. One of our favorite tablemates, Candy Clark, sat next to us. At a longer table, holding forth, sat Adam West, Burt Ward, and a bunch of Batman baddies. Murdoch’s Fox News sent a crew to cover this really big show. I don’t look for trouble; trouble looks for me. I espied a sly guy sidewinding his way to our table. He sported a frozen smile and ice cold eyes. He didn’t buy anything. He didn’t say anything. He waved his camcorder like a vacuum cleaner over my glossies of yore. Rutt Roww! He stopped and slowly tilted up to show Fox News viewers, graphically, the ravages of years in the saddle. I cackled feebly, “Heh, heh—I’m ready for my close-up, Mr. DeMille.” What I should have said: “I’ll be right back.” I should have pulled a Three Stooges gag: fake walking down stairs behind the table, waving good-bye. The POST headline was right, you know. We were has-beens. We are all has-beens. We are all will-bes. Mostly, we are all are-nows. Be here now! That’s all there is, folks. There isn’t anymore. A pard o’ the pen writes and asks why I looked different from show-to-show. Well, I aged and gained weight. I wore different duds. My hair varied in length. Sometimes it was combed. Jean Burt Reilly bleached it. I felt scalped. The bleach smarted. Seasons passed. My hair was allowed to grow back to its original feelthy blond. Ah! The great Warner Bros. cameramen! Each had his own way of shooting me. Ted McCord (“East of Eden”, “Treasure of the Sierra Madre”) accented my eyes with a magenta spot. He was a perfectionist. When the director called for a re-take, McCord would jump in and improve the lighting. His crew sure wasn’t motley. We had a wide variety of scripts. They ran the gamut from horse opera to soap opera, from stalwart straight shooter to slapstick saphead. I showed my range on the range, foolin’ around with facial facets. Gordon Bau headed the make-up department. He required his talented make-uppers to apply Bau’s own private brand of greasepaint. Conflict of interest? The stuff had a distinct aroma. I could smell a contract player from 20 paces. Col. Warner hated to see shiny ears in rushes. Each a-yawn, the make-uppers spelunked every orifice above the neck. They slathered us up pretty thick. Ted McCord and brethren worked hard to give our pusses a modicum of dimension. Sweet old Bob Conrad was one-up on the Colonel. He’d sit on a fold-up chair, outside his sound stage, a huge aluminum collar ‘round his throat to catch some rays. Back then, we had an ozone layer. A few weeks after the Colonel let me out to pasture, I sat in a barber chair on La Brea Avenue. The guy in the next chair was an animator from Warner’s cartoon department. I told him I loved The Road Runner. He told me how the show evolved. They wanted to make the show pure action. Wile E. Coyote of the Acme Mail Order Company was in constant pursuit of The Road Runner, who was the carrot on the stick, always just beyond Wile E.’s reach. Wile E. was a wild, complicated character, expensive to draw. They made The Road Runner simpler, a bullet train, a blur-no dialogue—moving lips took time to draw. What then? Tweet Tweet? Well, there was this funny janitor who mopped the hallways in the animation building. To let the crowd around the water cooler know he was coming, he’d go “Beep Beep! Beep Beep!” Eureka! The barber asked me if I were in a play. “No, why?” “You’ve got a pretty healthy glob of make-up in your left ear.” Yipes! Henceforth, in my 10 years as a klown, never once did I hear the roar of the greasepaint. I settled for the pitter patter of pancake makeup. One time NEWSDAY (Long Island’s newspaper) asked me to list my five favorite Westerns, and why? (How about 50?) I tossed ‘em the first five to come to mind. “Shane”—Woody Allen’s favorite flick, period! And he doesn’t like Westerns. Alan Ladd’s last hurrah. Paramount should have pitched him for an Oscar. Palance shoots Cook Jr. in the mud. Pow! Right between the eyes! 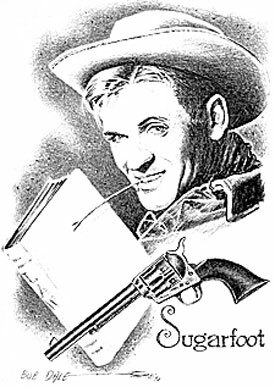 “Destry Rides Again”—sorta Sugarfootish. Gentle, funny Stewart at his best, before his post World War II hard-bitten, steely-eyed avenger. Terrific ensemble cast, beautiful barroom brawl. La Dietrich’s raucous physical comedy, with a dash of pathos, added salt to this zesty stew. Wanna hear my rendition of Marlene’s “See What the Boys in the Backroom Will Have”? “The Outlaw”—Every teen-aged lad’s guilty pleasure. No, it wasn’t shot at the Grand Tetons. It was shot by the master Gregg Toland (“Citizen Kane”, “The Long Voyage Home”; “Wuthering Heights”, etc. etc.). Howard Hughes should have found time to direct more flicks. “Tom Horn”—To me, the last of the great westerns. McQueen, most memorable movie star born in the ‘30s. Powerful parable of Big Biz’ discarding, long-time, loyal workers like squeezed lemons. “The Westerner”—Gregg Toland again. Wyler, Brennan, Cooper at the top of their games. Best of the ‘indoor’ westerns. Coop is mystical in the last of his great performances. Watch him roll a ceegaret…Ooops! No John Wayne!!! Sorry, Duke—You the man!